Sacred Heart College, a Roman Catholic liberal arts college for women in Belmont, was founded in 1892 at the request of Leo Haid, bishop and vicar apostolic of North Carolina. The college, operated by the Sisters of Mercy, offered elementary and secondary courses. In 1935 Sacred Heart College was accredited as a junior college and academy, and in 1966 it became a four-year liberal arts institution. Throughout the 1970s and 1980s, enrollment fluctuated. It closed in 1987, citing financial troubles and the declining success of small Catholic women's schools. (Click to see larger) Campus,1968. Image courtesy of Gradatim. Available from http://archive.org/stream/gradatim1969sacr#page/n7/mode/2up (accessed November 9, 2012). Graduated in 1985 under Social Work Degree with BSW. Thank you for visiting NCpedia. 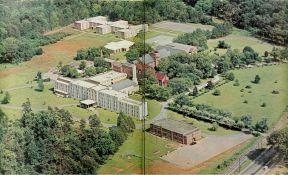 Please contact the State Archives of NC at archives@ncdcr.gov or (919) 814-6840 in case they know how to obtain Sacred Heart College information. I wish you luck in your research.